I know I said I would by light on memes but honestly Top Ten Tuesday is reliably one of my favorites. The bloggers over at The Broke and the Bookish really pick great topics which make me think and make me want to go and read and find new blogs to read. 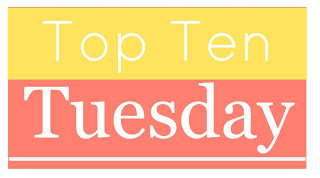 This week’s topic is Top Ten Books I Resolve To Read In 2013. I have had this on my GoodReads lists since ’09. I have read amazing things about it. Every time I see it one someone’s list I think I have got to read that. OK, this is the year. I read Hood in ’07 and Scarlet in ’09. I have no reason why I have not finished up the trilogy. I loved both of the others, so Tuck in ’13. When this was popular it was everywhere. It is still on many “Best of” horror lists. I have checked it out of the library twice and just never picked it up. It is my October read for ’13. I don;t know either. Given my love for Poe and the fact that every list has Poe on it somewhere how have I not read this one. It is classic. I have read bits and pieces but never the whole thing from start to finish. So yes, I will this year. I have wanted to read more Caitlin Kittredge and this looks fabulous. Steampunk + Lovecraft + Magic + YA = Yes, Please. I love memoirs, the stranger, the better. Now if I can just get over the clown cover on this one I think I will really like it. After The Fault in Our Stars I must read one more John Green. That is all. I have read all of Grimm and all of Andersen but I have not read all of Perrault. It is a serious gap in my fairy tale education. So my bestest librarian book bud and I have made an agreement. I said I would read this and she has promised to readAlice. I am not sure I will get to all of them but I want to read at least one more. So The Book Thief made my list too, I am prepared to cry based on what everyone has said about it. House of Leaves is great, it is a book that should be read at least twice (in my opinion) to get the full effect. House has been on my list for so long I really need to work through it. I need to read The Book Thief & more John Green books too! Can’t wait to dive in! I am excited about this year too. Thanks for stopping by. I really want to read the Book Thief this year too. I have had it on my shelf for a while and it’s about time that it’s read!